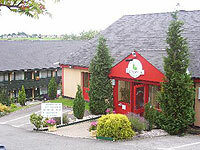 The Campanile is part of a European network of hotels that offer budget accomodation with a continental flavour. The Campanile is located alongside the A48 on the Eastern approach to Cardiff (just off the M4), so it is ideally situated for business travellers. 47 comfortable and well-equipped rooms. Each room has a television, a desk and a telephone with a direct line. Courtesy tray with kettle, tea, coffee and biscuits refilled daily in your room. WIFI access in all rooms (charged service). Conference room holds a maximum of 25 people.